AutographsForSale.com features a large selection of Starbucks regional collector mugs from around the world. 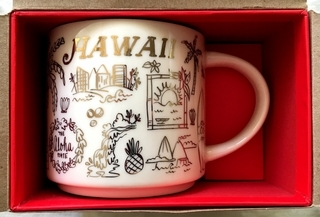 Featured at right is a Starbucks 2018 Hawaii Holiday Been There Series 14 ounce ceramic collector coffee mug. NOTE: due to the fragile nature of Starbucks mugs we generally only ship them within the United States.